Dance Commentary by Heather Desaulniers: Ballet San Jose - "Don Quixote"
No matter which company is presenting it, “Don Quixote” is not my favorite full-length narrative ballet. I find it puzzling that in most versions, the protagonist and namesake of the work plays a very minor, almost absentee role. In addition, Act II (the Gypsies/Dryads) seems to happen very much in isolation, being thrown into the middle with little purpose, meaning or relation to the rest of the ballet. That being said, even I can admit when a good version of “Don Quixote” comes along, as was the case with Ballet San Jose’s company premiere (staged by Wes Chapman after Marius Petipa and Alexander Gorsky). The story, as always, still had these inherent issues, but the performances, choreography and design were delightful. Act I’s opening scene was enchanting – the costuming, stage decoration and ambiance working together to transport the audience to a vibrant Spanish village. At this performance, soloist Junna Ige danced the role of Kitri, and her first solo was the stuff ballet dreams are made of. Ige has the technical chops for this demanding role, yet her commitment to artistry was the shining star. 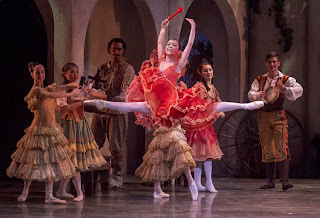 Over the years, the famous Kitri grand jeté (the one with the back leg in attitude) has turned into a jump that is all about the dancer’s head touching her back leg. Though Ige was true to the choreography and probably does have the flexibility to accomplish this feat, her jeté reflected the character’s intention, personality and joie de vivre. Ige wasn’t trying to create a spectacle by doing tricks, rather, she was embodying Kitri. Maykel Solas, as Basilio, had some brilliant moments including his Act I pirouette series – anyone who can manage four/five rotations to the left, while slowing down to hold the final pirouette position on demi-pointe deserves some extra praise. Act II’s story does need some better cohesion with and connectedness to the rest of the ballet, yet one cannot ignore its standout performances. Maria Jacobs-Yu’s Cupid was perfection, both in technique and character interpretation. She was part imp, part matchmaker, part supernatural, all while managing some challenging choreography. The entrechat quatre batterie and relevé passé sequence was simply transcendent. Jing Zhang as the Queen of the Dryads was appropriately statuesque and regal, though I wish that she had put her heel down all the way to the floor in between each fouetté relevé, for no other reason than to spare her Achilles tendon. And in the swarm of ethereal splendor, one of the Dryads absolutely sparkled. Ballet San Jose apprentice Kathryn Meeusen will definitely be one to watch in the years to come. One thing that I have noticed with Ballet San Jose is that more often than not, in the larger group scenes, the stage looks crowded. And this doesn’t seem to be because of sets/props that are too big or costumes that are too overwhelming, there are just too many dancers onstage at one time. And sometimes the choreography suffers a bit as a result. During the Act I Toreadors’ variation, one of the corps women was unable to extend her front leg in jeté, not because she couldn’t, but because she would have kicked someone, who incidentally also had nowhere to move, no way to adjust and no space to get out of the way.